And it’s pretty easily verifiable when you work backwards with the parametrization. Is there something I’m missing? Is there a method to working from implicitly defined 2D functions to parametrizations for them? I don’t know about “in general,” but if you make the substitution y = tx here, you can get that one. Coincidentally, I was just reading about this yesterday. As @CalcDave indicates, you think about y=tx. Which is to say, the curve is parametrized by slopes of lines through the origin. Besides the origin, any line through the origin (and not an axis) hits the curve at exactly one point. One you set y=tx, you can plug that in the equation and solve for x and obtain the formulas you mention above. Hmmm… The “parametrize by slopes of lines through the origin” is a standard trick to get rational or integral points on an elliptic curve. You have to substitute it by “parametrize by rational slopes of lines through a rational point on the curve” and the origin is a rational (and integral) point of the Folium of the Descartes. A trick that comes in very handy with some Project Euler problems. which is Euclid’s parametrization of Pythagorean Triples. Hi everyone! Thanks for the solution and discussion. It totally works out, substituting . 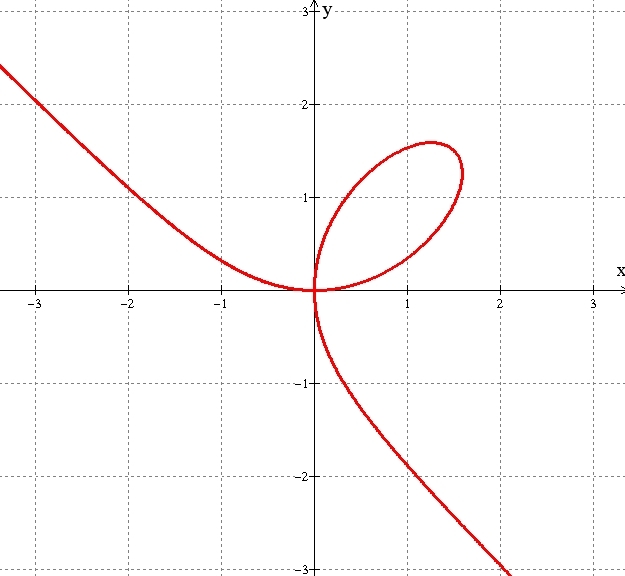 I haven’t had time to really think about how by doing this we are parametrizing the curve by slopes of lines through the origin. But I’m going to think a bit more about it. @Jamie: Interesting connection! I remember reading that derivation to find all rational points on a circle. Thanks again. I’ll report back once I really sort out in my mind what that substitution is actually doing, and can explain it to — say — a high school student. Something totally different occurred to me here. I wonder if it works? x^3 + y^3 = (x+y)(x^2 – xy + y^2) = (x+y) ((x+y)^2 – 3xy). I thought of this expression because it matches the 3xy on the other side. Now let’s let s = x+y and p = xy. s^2 – 3ps – 3p = 0. Well, at least I’ve reduced a cubic to a quadratic. That has to be worth something? Wait, it’s quadratic in s, but just linear in p! There, that has to help a lot. I’m fearing that there’s still some quadratic solving to do down the road here, though.